Eagan’s Will Merchant was grinding in the corner. Mucking for the puck. Then he was wheeling past a Moorhead defender, scooting behind the net after beating two Spuds with some nifty maneuvering. 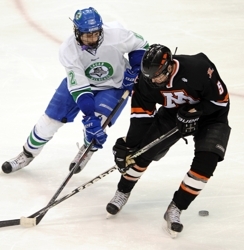 Then he was turning and shooting, sliding the puck between his legs as he made his 180-degree loop around Moorhead's Noah Julin. 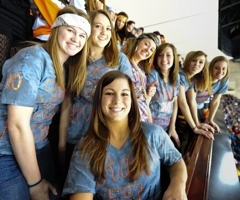 All Merchant had was a sliver of an opening over the shoulder of one of the state’s elite goaltenders. 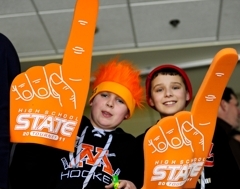 “He’s got unreal hands,” Michael Zajac said about Merchant, whose goal with 4 minutes, 18 seconds left propelled the Wildcats to a 4-0 victory over Moorhead on Thursday, March 10, in the Class 2A quarterfinals at the Xcel Energy Center in St. Paul. 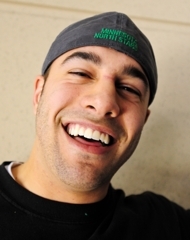 “He always works on that between-the-legs move in practice, and he pulls it out in the state tourney. 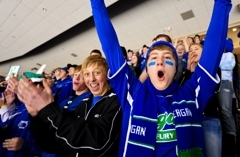 Eagan’s Nick Kuchera scored 3 minutes, 35 seconds in to the first period, and the score remained 1-0 until late in the third. 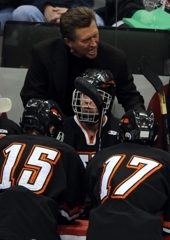 With Moorhead standout goaltender Michael Bitzer stopping an avalanche of pucks, it looked the No. 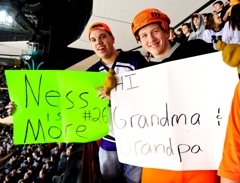 4-seeded Wildcats (20-6-2) might not score again. Their best chance for a victory, it seemed, was to hang on for dear life. Then Merchant, a junior who has 32 goals this season, turned the game with his work both in the corner and in front of the net. 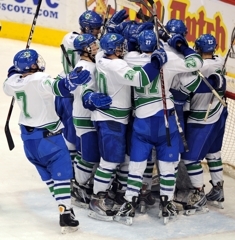 Eagan added two empty net goals in the final 2:10 to secure the victory and earn a date in the semifinals with Eden Prairie (22-6-2). 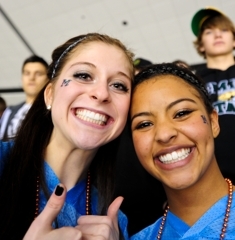 The Wildcats and Eagles meet at 8 p.m. on Friday at the Xcel Energy Center. Bitzer stopped 30 shots, many of them from close range. He kept the Spuds (19-6-3) in position to at least force overtime. At least, that is, until Merchant’s YouTube-destined solo effort. "Everything just kind of happened, and it flows I guess," Merchant said. "Stuff just came to my mind, and I did it." I wasn’t a bigtime save or opportunity that earned Moorhead goaltender Michael Bitzer his nickname, ‘Chance’. It wasn’t a lucky gambling streak either. In fact, Bitzer didn’t earn the nickname at all. Regardless of the background behind the name, it’s hard to imagine that both skill and luck happened to settle on a goaltender named ‘Chance’. 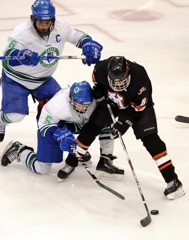 In Moorhead’s 4-0 loss in the Class 2A quarterfinal matchup against Eagan, Bitzer made 30 saves on 32 shots -- two of Eagan’s goals were scored into an empty net. Not a bad game for the junior goaltender, making his first start in the state tournament. 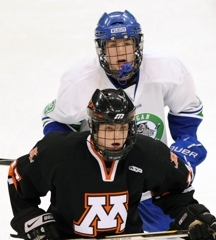 Though Bitzer was on the Moorhead team that met Eden Prairie in the 2008 Class 2A title game, he was there to back up then-starter Logan Marks. 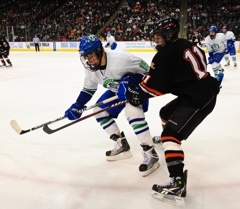 Bitzer’s first state tournament start may not have gone according to plan as Eagan’s first shot of the game found the back of the Moorhead net. Despite surrendering the opening goal, Bitzer displayed the skill set that contributed to registering an overall .932 save percentage while allowing an average of 1.95 goals per game. 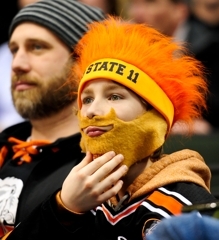 However, Moorhead’s season is not over quite yet. The Spuds have a consolation matchup against Lakeville North and another hot, junior goaltender Charlie Lindgren. “I’ve talked to (Lindgren) a few times in the Elite League,” Bitzer said. “He’s a great goalie and tomorrow should be a great game -- good goalie matchup. With continued performance in both the regular and postseason, it’s safe to say that Bitzer will draw some attention. The best way to cure state tournament jitters for Eagan was to combine a strong physical presence with stout defensive play. 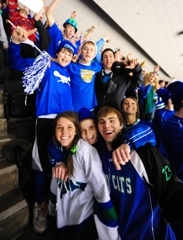 The result was a 4-0 victory over Moorhead in the state Class 2A quarterfinals on Thursday, March 10, at the Xcel Energy Center in St. Paul. Holding onto a 1-0 lead going into the third period, Eagan stayed aggressive yet disciplined with an abundance of heavy hitting. All those bodchecks that appeared to wear on the Spuds as the period progressed. Physical play is nothing new for the Wildcats. They have come accustom to playing the body on a daily basis in practices. It showed in a convincing final period. After the Wildcats took a 1-0 lead in the first period on a goal by Nick Kuchera, the defense locked down even more. It has been the trait of Eagan since the postseason, which included a 1-0 shutout in the Section 3AA finals against rival Apple Valley. “Seems like when you are playing a team like that sometimes you’re skating in mud,” Spuds’ coach Dave Morinville said. “They forced some of our guys to not have a good game, I can tell you that. 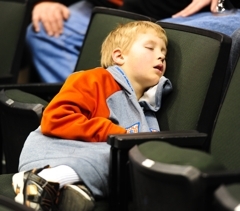 Midway through the third period Moorhead was trailing 1-0 and having difficulty even getting a shot on net. 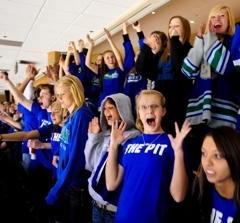 It only registered three shots on goal at the halfway point of the period as Eagan continued its solid defensive play. For the Wildcats, it was simple. Take care of business from the net out. If defensemen and forwards were not blocking shots, goalie Tommy Bodeker was smothering pucks and denying Moorhead even a sniff at a rebound. At the end of the third, Moorhead was able to get off more desperation shots to give it a total of 24 for the game, but in the latter stages, quality scoring chances diminished significantly. 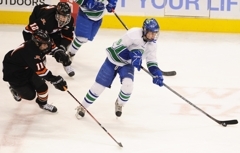 Eagan was content with getting the puck deep in the Spuds’ zone and making them go the length of the ice to penetrate a gritty defense to score. When trouble did arise and Moorhead was able to sustain a forcheck, the Wildcats escaped using the glass to clear their zone. 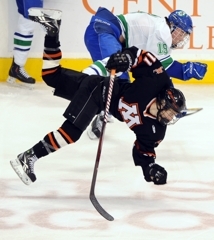 “Get it off the glass and out,” Merchant said. 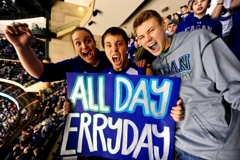 If Eagan had state tournament jitters, the No. 4-seeded Wildcats didn’t show them Thursday with a poised performance in a 4-0 victory over Moorhead in the Class 2A quarterfinals. After all, would a nervous squad be able to protect a one-goal lead for 43 minutes? Nick Kuchera’s goal just 3:35 into the game, which sneaked over the line inside the left post, gave the Wildcats an early lead — and something to protect for many minutes to come. Open ice remained at a premium for both teams throughout much of the rest of the game. 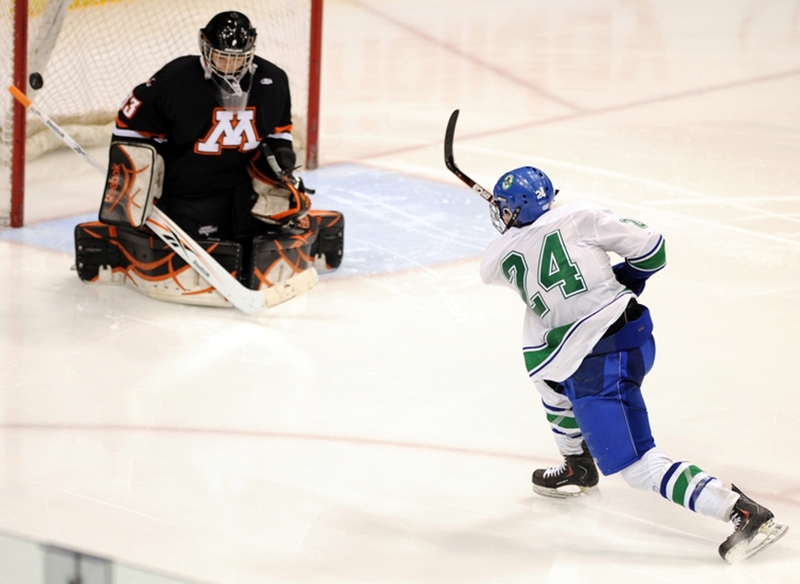 Any chances that made it through were turned away by Moorhead goalie Michael Bitzer and Eagan’s Tommy Bodeker. 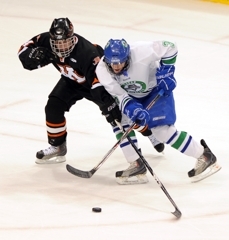 Eagan turned up the heat in the third period, outshooting Moorhead 8-2 over the first nine minutes. An insurance goal finally arrived with 4:18 remaining when Will Merchant made a nifty between-the-legs pass to himself to work free in traffic before rifling a wrist shot top shelf. 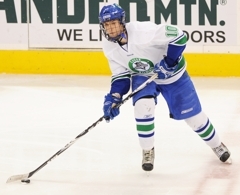 Eagan added two empty-net goals. 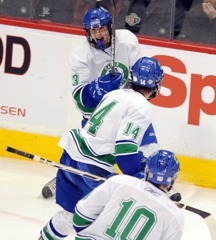 For a long time, it seemed as if Eagan could be destined for a 1-0 victory — the same score the Wildcats produced in a section final victory over Apple Valley, which gave them their second state tournament berth in school history (2006 was the other). Bodeker finished with 27 saves for his second consecutive shutout. Eagan advanced to play No. 1-seeded Eden Prairie in Friday’s semifinals. 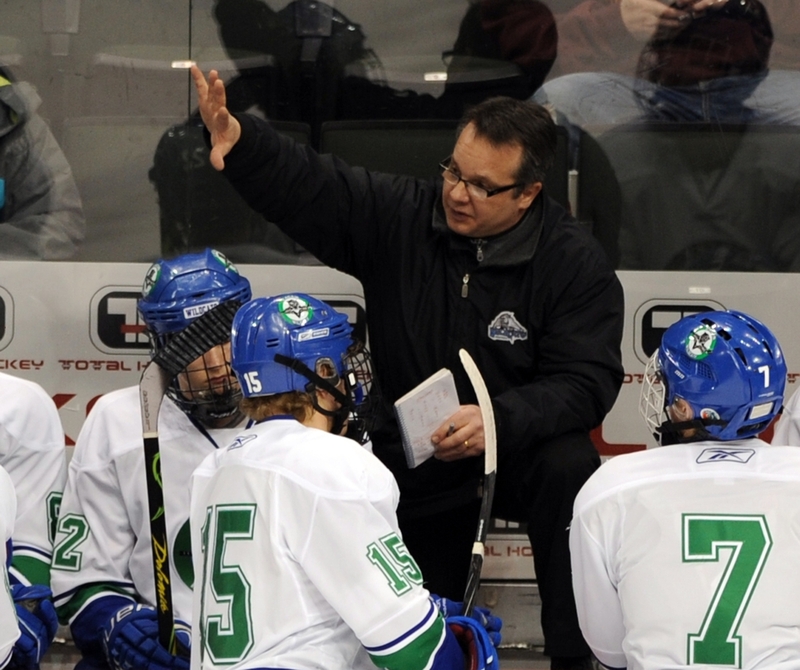 The teams met in December, with Eagan taking a 4-2 victory. 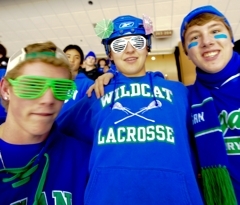 Eagan has been winning its playoff games with toughness, grit and just the right amount of skill -- something Merchant showed in spades on the Wildcats' second goal. Battling for a loose puck with two Moorhead defensemen, Merchant whacked, chipped and eventually dropped a pass between his own legs to get free. 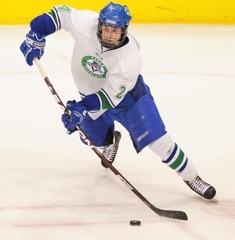 He twirled, grabbed it and rifled a shot over Michael Bitzer's shoulder to give Eagan some breathing room. The junior continued to throw his weight around in the defensive zone, while also managing to create offensive chances. Seemingly tireless, Zajac played big minutes. 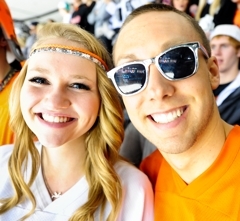 He was held scoreless, but his impact was felt as much with all the zeroes on Moorhead's scoresheet. Tested early and often, Bitzer allowed the Spuds to remain in the game until late in the third period. He finished with 30 saves on 32 shots, flashing a quick glove on several occasions. 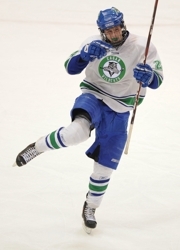 As Eagan buzzed the net, Bitzer remained calm and collected -- perhaps not a surprise as he's been on the varsity roster since his freshman season.